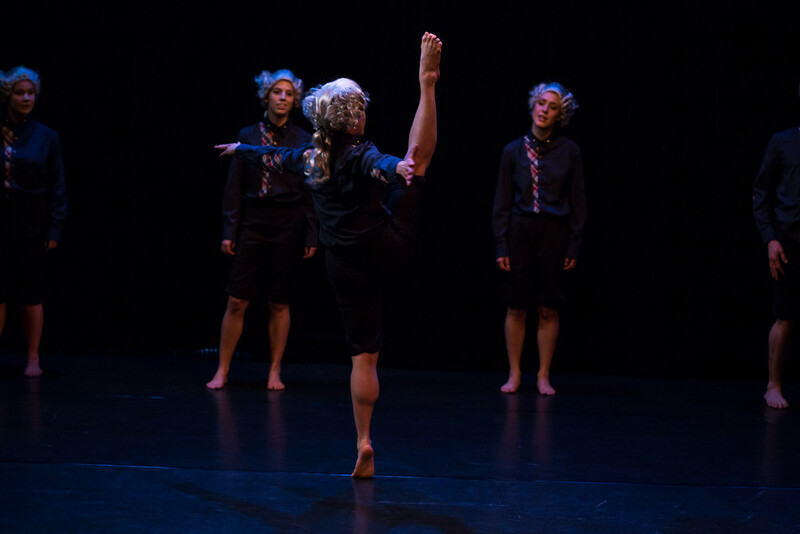 If you’re looking for a dance-theater work with equal stakes in strong dance technique and Dadaist absurdity, look no further than AJnC’s Believe Me or Not (March 6-8 and 13-14 at 12th Avenue Arts). 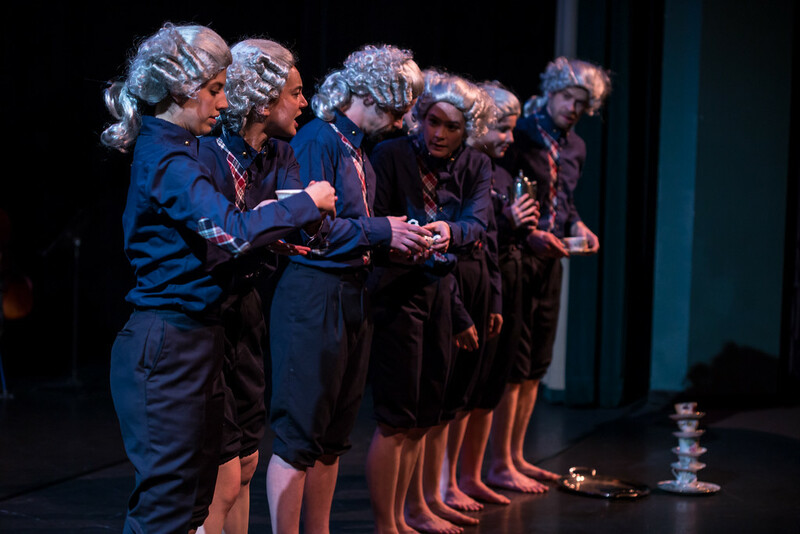 For over a year, choreographer Amy Johnson has been grappling with a fictional world of her own making, a sort of stew comprised of Dada manifesto writer Hugo Ball, Oscar Wilde, working class aspirations, blue-collar uniforms, tea time, white wigs fit for a founding father, and the comedy-tragedy that is daily life. With seven performers (Danica Bito, Lorraine Lau, Nikolai Lesnikov, Alexandra Maricich, Mariah Martens, Sean Tomerlin, and Jan Trumbauer) and two musicians (Nico Tower and Daniel Mullikin) along for the ride, Johnson will be the first to present an evening-length dance show at Capitol Hill’s exciting new 12th Avenue Arts. And that’s after a February 21 premiere at Federal Way’s Centerstage Theatre. Johnson jumped at the chance to show her work at multiple venues over multiple weekends—a relative rarity for Seattle’s independently producing artists. SeattleDances sat down with Johnson to hear about her process before and after she gets to the studio. SeattleDances: Tell us about how you started the work. Johnson: Ninety-five percent of the time, I feel like I’m preparing to write a thesis paper when I make dance. It doesn’t start in the studio, it starts from research, and it’s usually several months to a year before the work comes in to the studio. So for this piece, the literature of the work comes from Hugo Ball, the ringleader of the Dada movement in Zurich, and two of his books: Flametti, which is a fiction inspired by his time working with a cabaret theater when he first moved to Zurich, and A Flight Out of Time, which is his diary. The other main source is Oscar Wilde’s The Picture of Dorian Grey. SeattleDances: The Wilde strikes me as relevant to anyone making art. Johnson: Or to being human! But the original, original seed for this was from these two British comedians from the 60s, Peter Cook and Dudley Moore. They had a comedy act together that was wildly popular. So funny, so British, about the chaos of the everyday and the absurd existence of reality. SeattleDances: So how do you get from there to Hugo Ball? Johnson: I have this really big book of manifestos, mostly art manifestos. I really like Dadaism, the spontaneity and the wildness of Cabaret Voltaire, although my work is not Dada work. What I like most about the Dada movement in regards to myself as an artist is that a lot of it was borne of a frustration of not being able to change the climate during World War I. To give a recent example, it reflects how I feel about the Ferguson-related conflict and the militarization of the police. I want no part of that. I can’t help but be American, this is where I’m born. I don’t know what to do about it, but I can choose how I react to it. It feels enormously out of my control, but it also feels like it has everything to do with me. Because I live here. It’s a sad comedy of life. SeattleDances: How does that sad comedy play into your work? Johnson: My defense mechanism is humor. It gets me through a lot of days. Things that are not the end of the world, you have to take in small measure. You have to laugh at it. Life is weird funny and horrible and tragic and the same things that make you laugh make you cry. SeattleDances: So after you’ve been working with your sources on an intellectual level, how do you transition that into working in the studio? Johnson: Dance vocabulary from piece to piece for me is very intentional. Each piece has its own vocabulary, so it’s helpful to have space to craft some of that and then test it before starting the long work. I’m the artist in residence at eXit Space, which gives me free rehearsal space for the season—that’s been enormously helpful. There are five cast members who do the bulk of the dance material, and two cast members who do a more theatrical part. And then the musicians. It’s sort of been a popcorn game of getting all the wheels spinning and then taking all the extra space out of the work, tightening it up. SeattleDances: What is the movement like? Johnson: The dancers are great technicians. Technique is important to me in my work. I was lucky enough to do a Cunningham residency at Cornish during the company’s farewell tour. I was able to embody some of that for a year, and it resonated deeply with my own aesthetic. We’ll see some of what people call now classical modern vocabulary in Believe Me Or Not. But it’s so relevant. I feel like a lot of people feel it’s not relevant anymore. Hopefully I’ll help make it relevant again, if people have doubts about it being an efficient mode for modern dance. SeattleDances: What excites you most about being at 12th Avenue Arts? Johnson: I feel really excited showing this dance work in what is typically seen as a theater space. I don’t want the boundary between dance and theater for the viewer. I want it to be the same audience. SeattleDances: Tell me about the visuals. Johnson: The wigs and the costumes are a play against each other in a lot of ways. The costumes are literally blue collar uniforms. In this fictional world, they work in a factory where precision is paramount. But then there’s these wigs. Pretend that the wigs are Air Jordans. People used to go nuts over Air Jordans. If you had Air Jordans, it signified wealth, prosperity, and fashion. Now you can get Air Jordans at Ross. If you get them now, you’re a little late, but, by golly, you got those Air Jordans. That’s what the wigs are. These people, these characters working in this factory, they’ve finally got these wigs. It doesn’t mean anything anymore, they don’t have the same status, and it’s sort of a joke they wear them. But it brings them just a little bit of peace, a little bit of emotional security. SeattleDances: There are million ways to make dance, but such a text-driven intellectual approach seems rare. What draws you to that kind of creative process? Johnson: I really love dance in so many ways, but I’m not often inspired to make dance from dance. Part of it has to do with obsession with ideas. Once I’ve latched on to something, I have to be obsessive in an imaginary place for quite a long time. I try to be in the mental space for long enough that when I do get into the studio, the choices for the particular piece are intuitive, and I can direct right from the beginning: what works, what doesn’t, and why. That’s been my schtick, and it’s worked out. I’m lucky to have come across it. I don’t ever say I’m keeping my gaze on the horizon for anything that catches me. I can’t do that. Way too intense. Instead, it creeps up on me, and suddenly I’m making a piece. Believe Me or Not runs March 6-8 and 13-14 at 12th Avenue Arts. Tickets available on Brown Paper Tickets. More information about Amy Johnson and AJnC available on her website.